Solving problems is a constant challenge for most managers. The effectiveness of a manager is directly tied to their ability to accurately define a problem and find the most effective solution. This week’s Tip discusses a simple and proven method for solving even the toughest problems. Like any project, problem solving involves a series of steps. When completed, the following simple steps should provide an effective solution to nearly any problem. Be certain to complete the steps in order before advancing to the next step. Step 1: Define the Problem. This is often the most difficult part of solving any problem. Without an accurate problem definition, we cannot begin to find an appropriate solution. When defining a problem, keep it simple and direct, limiting your description to 10 words or less. Once you are certain that your problem definition is accurate, proceed to Step 2. Step 2: Outline Possible Solutions. Make a list of all possible solutions to the problem you’ve defined. Feel free to brainstorm and let your imagination run free. This is a step for gathering ideas – not for being critical. When appropriate, be sure to seek the input of others. Step 3: Determine the Best Solution. Drawing from the list generated in Step 2, select the best possible solution to the problem. Step 4: Implement Your Best Solution. Be sure to monitor the problem and your implemented solution for its effectiveness. If your chosen solution is ineffective, return to Step 3 for an alternate idea. Infrared inspections can help to detect latent moisture within smooth or gravel-surfaced insulated roofing systems. For roofs covered with high-density ballast or pavers, other forms of non-destructive testing such as capacitance or nuclear gauge testing may provide better results. 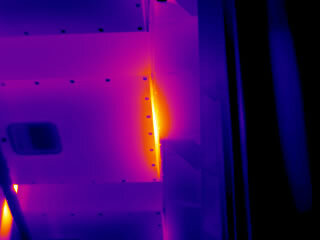 For infrared inspections performed during post-sunset hours from the exterior of a building, the collection of accurate infrared data is highly dependent upon roof construction. Applicable roof construction is as follows: Built-up or single-ply membrane installed over, and in continuous contact with, a layer of insulation or an insulating deck. Roof may be smooth, granule-surfaced or gravel-surfaced. If gravel-surfaced, stones should be pea sized or smaller with a thickness of less than one inch. Roofs covered with concrete pavers or river washed ballast (walnut-sized or larger rock) are not candidates for an accurate infrared inspection. 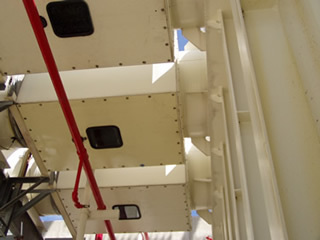 In general, the presence of ballast materials will mask the small temperature differentials associated with latent moisture since they are capable of absorbing large amounts of solar energy during daylight hours. For some ballasted roofs, it may be possible to detect limited thermal patterns associated with latent moisture; however, this is highly dependent upon roof construction, ballast thickness and density, and local weather conditions. In most cases, the presence of ballast will prevent a thermographer from accurately detecting thermal patterns associated with latent moisture. For ballasted roofs, it is often prudent to utilize either a capacitance or nuclear gauge instead of thermal imaging. In the hands of a competent technician, these technologies will usually provide more accurate data for detecting evidence of latent moisture within ballasted roofing systems. In the case of arc flash, an ounce of prevention is worth a ton of cure. In future Tips of the Week, we will continue to cover the topic of arc flash and how to protect against it. This simple recommendation can be applied to any thermographic inspection and serves to avoid unnecessary liability by eliminating guesses and sticking to facts. For more information on infrared training or standards for performing infrared inspections, contact Infraspection Institute at 609-239-4788 or visit us online at www.infraspection.com. In general, hot spots within electrical systems are indicative of problems such as loose connections or overloaded circuits. For some electrical components, high temperature operation is normal and an infrared imager can be used to help ensure that these devices are functioning. During a routine infrared inspection of electrical distribution systems, similar components under similar load are compared to each other. Items appearing inexplicably hot are reported as exceptions to be further investigated and appropriately repaired. For components that normally operate at elevated or high temperature, a lack of heat may be indicative of an exception. Capacitors used for power factor correction are good examples of components that are normally warm. Properly functioning capacitors should operate above ambient temperature and their casings should be uniform in temperature when compared to similar units under similar load. Thermal overload relays are found in many motor controllers. The elements of these relays, often called heaters, may operate at high temperature when the circuit is under load. When compared to adjacent phases, these elements should be similar in temperature with no pronounced hot spots. Electric strip heaters are used to control humidity within switchgear enclosures. Switchgear heaters usually operate at very high temperatures and their operation can easily be verified with an infrared imager. Cold strip heaters may be indicative of a failed element, improper control settings, or a de-energized control circuit. The above are just three examples where elevated temperatures are normal. Thermographers should always be on the lookout for cold spots that may be indicative of problems in addition to hot spots traditionally associated with exceptions. “Begin with the end in mind” is a frequent quotation from Stephen Covey’s bestselling book, The 7 Habits of Highly Effective People. Applying this principle can have a dramatic impact on many things including an infrared inspection program. Prior to underatking any task or project, it is important to have a clear understanding of what the final outcome should be. With this vision in mind, one is able to gauge the effectiveness of their efforts in achieving goals. By beginning with the end in mind, one knows what the goals are and can help chart a course of action that leads directy to these goals. What is the role of thermography – PPM, PdM, Q/A or Condition Assessment? Which systems/equipment do I want to inspect? How will thermorgraphy improve operations – decrease unscheduled downtime, improve product quality, reduce production losses? What data are available for measuring the program’s effectiveness? Once these questions have been answered, one can begin to set up an infrared inspection program with necessary equipment, staff and support personnel. By beginning with the end in mind, an infrared inspection program is more likely to succeed by providing value and producing measureable results. A simple procedure for calculating emittance may be found in the Guideline for Measuring and Compensating for Reflected Temperature, Emittance, & Transmittance available from Infraspection Institute. For more information or to place an order, call 609-239-4788 or visit us online at www.infraspection.com. Be certain to use tables that match your radiometers spectral response and your target’s temperature. Choose representative sample and test for emittance value. Use these values whenever similar object is encountered in the future. Use tape, paint, or powder with known E. Prior to modifying any surface, be certain it is safe to do so. Use subject radiometer to measure target E value. This practice is preferred as it provides the most accurate emittance values. The procedure for measuring emittance values is described in detail in the Guideline for Measuring and Compensating for Reflected Temperature, Emittance, & Transmittance available from Infraspection Institute. For more information or to order a copy, call 609-239-4788 or visit us online at www.infraspection.com. The above procedure is described in detail in the Guideline for Measuring and Compensating for Reflected Temperature, Emittance, & Transmittance available from Infraspection Institute. For more information or to place an order, call 609-239-4788 or visit us online at www.infraspection.com. 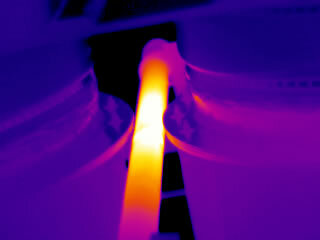 Thermographers routinely observe thermal patterns and measure temperatures across the surface of objects. 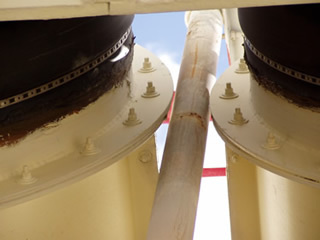 Understanding heat transfer can greatly enhance one’s ability to diagnose observed thermal patterns and knowledge of how and when infrared inspections should be performed. By calculating the heat transfer characteristics of the system being observed, a thermographer can increase his/her understanding of the information that thermal imaging is providing. The thermographer can also benefit by understanding what may need to be done to the subject system in order to generate a thermal signature for the features of interest. For complex systems, finite element analysis (FEA) provides a more powerful approach. FEA allows modeling of complex geometry and complex time relationships and boundary conditions. FEA can provide clear results that enable thermographers to be more efficient and profitable while expanding their range of applications. FEA based heat transfer analysis can handle convection, conduction, and radiation based heat transfer and also extends to include fluid flow applications. Having a third party provide this analysis is often the best alternative. This can be someone who is in-house in a large company or an outside source such as a consulting firm. Tip submitted by Jack Kleinfeld, P. E.
SIC and NAICS codes are numerical codes used to categorize a wide variety of products and services. Knowing the proper codes can be helpful in preparing contract documents, searching databases, or completing forms and reports where such numbers are required. Standard Industrial Classification (SIC ) are numerical codes designed by the U.S. Government in order to create uniform descriptions of business establishments. SIC codes can be used to search databases and/or to identify companies that produce specific products or services. The SIC code for Infrared Inspection Services is: 8734-15. This is a subset of the heading, Testing Laboratories. In 1997, the North American Industry Classification System (NAICS) replaced the SIC system. The NAICS was developed jointly by the U.S., Canada, and Mexico to provide new comparability in statistics about business activity across North America. In the 2002 version of the NAICS, Infrared Inspection Services are classified under code 541380, Testing Laboratories. As with SIC codes, a company’s classification may include other categories depending upon a company’s core business and/or future changes to existing NAICS codes. For more information on NAICS codes, visit the U.S. Census Bureau. As always, infrared inspections of electrical systems should only be performed by properly trained and certified thermographers following all appropriate safety precautions. For information on thermographer training and certification or to obtain a copy of the Guideline for Infrared Inspection of Electrical and Mechanical Systems, contact Infraspection Institute at 609-239-4788 or visit us online at: www.infraspection.com. Many infrared applications standards require that infrared test equipment be within calibration prior to the conduct of an inspection. Although performing a full calibration on daily basis is impractical, performing some simple operational checks can help to ensure that equipment is functioning properly. Allowing imager to stabilize with ambient temperature. After completing the above, power-up the thermal imager and note that the imager initializes properly. Once the imager has initialized, adjust imager controls to normal temperature range. Focusing on a high emittance target such as a tabletop or a wall covered with latex paint, check the monitor for image clarity. If the image has inexplicably hot or cold pixels, perform a non-uniformity correction. Once the image appears clear, a small Delta T can be created by placing one’s hand on one of the above high E surfaces for a few seconds. After removing the hand, image this same area and note the thermal pattern and its intensity. With a properly operating thermal imager, the thermal pattern of the hand should be clearly visible and last for at least one minute. For more information on thermographer training and certification, contact Infraspection Institute at 609-239-4788 or visit us online at www.infraspection.com.